We decided to organize a friendly cookie bake-off at work this holiday season to raise money for charity. The event's aim was getting wide participation, and so there were two ways for the staff to participate. For those that liked to bake, they could enter the competition free of charge as a baker, needing to pay only for the ingredients required to bake their recipe. Everyone else had the option of becoming a judge of the competition for a small donation of $5. What did a judge receive for his/her $5 donation? … A chance to taste as many of the cookies they wanted, of course! Each baker’s entry was assigned a number and the judges were asked to vote for their favorite cookie. The winner was to be decided by whichever cookie received the most votes. The winning baker would get to donate 100% of the proceeds to the charity of his/her choice, and the pride of being crowned the company baker champion. choice: UNICEF. It was an amazingly successful event; bringing people together for a good cause while having some fun in the process. We hope to make it an annual tradition! Here’s the recipe that scored me the win. I hope you enjoy! In small bowl sift together the flour and baking powder. Stir in 1 cup semisweet chocolate chips. Set aside. In a separate microwave safe bowl combine the butter and the remaining 2-1/2 cups semisweet chocolate chips. Microwave for 1 minute and stir well. Continue to microwave in 30 second increments stirring in between until the chips have melted. Approximately 1-1/2 to 2 minutes total. The mixture will be thick. Meanwhile use an electric mixer to beat the eggs, sugar, and vanilla extract. Add the melted chocolate mixture and beat until completely combined. Add in the flour mixture and mix until just combined, do not over mix. Allow the dough to rest 10 minutes to firm up a bit. Scoop approximately 2 tablespoon mounds of the dough onto parchment paper lined baking sheets at least 3 inches apart. You may have to bake in batches as you can probably only fit 12 cookies per sheet and this recipe makes approx 40 cookies. Bake for 10 minutes rotating the baking sheet once after 5 minutes. Allow cookies to cool completely before filling. To make the filling beat together the butter, confectioners sugar, marshmallow cream, and peppermint extract until smooth. 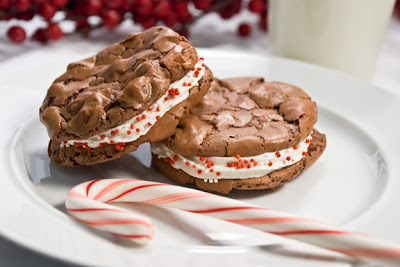 Spread 1 heaping tablespoon of the peppermint filling on the undersides of half the cookies. Alternatively you can use a decorative tip to pipe on the filling. Sandwich with the remaining cookies. Sprinkle the edges with the nonpareils if desired. Store in an airtight container in the refrigerator.